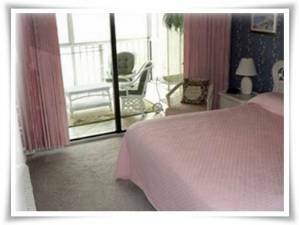 Come stay at the famous Regency Towers on the quiet East End in Panama City Beach, FL. This gated resort with 24 hour security has something for everyone in your family or group. With almost 1700 square feet in this 3 bedroom, 2 bath condo, there's plenty of room for the whole family to enjoy your gulf front vacation. When you first open the door, you’ll want to come back to this condo year after year. All the bedrooms have ceiling fans, TV/Cable/DVD, wall-to-wall closet space, lots of dresser drawers, and are carpeted. The large master bedroom suite has a KING bed, and private bath. This room has sliding glass doors that open into the Sunroom/Balcony with striking Ocean and eastern shoreline views. The second bedroom has a QUEEN bed, the third bedroom, perfect for the kids, has two SINGLE beds. If you need additional sleeping room, there is a Queen size sofa bed in the living room (in front of the big screen TV!). Relax in the spacious living room after a long day at the beach and watch your favorite TV show, sporting event, or movie on the new over-size plasma TV, with DVD player. Or, borrow one of the many books and catch up on your reading. There’s plenty of seating, with a comfortable couch and two recliner chairs. The living room also has sliding glass doors that open onto the Sunroom/Balcony. The mirrored walls in the living room and dining room reflect the Ocean and the Sky for you to enjoy. 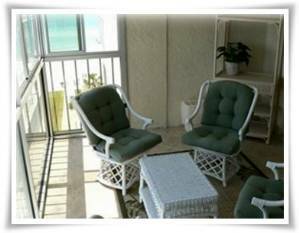 Step into the Sunroom/Balcony, and see for miles down the beach toward St. Andrews State Park, and out to the Ocean. You're on the 7th floor, and are very close to the height of the Pelicans flight path, and can see schools of fish, manta rays, and Dolphin in the Ocean below. The room has two sets of sliding glass doors, and floor to ceiling windows. An important safety feature for our younger guests are the stationary lower windows, while the upper windows slide open. 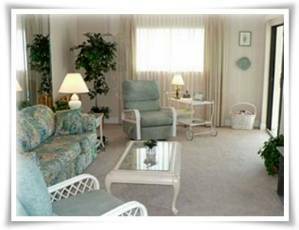 On warm days, open the windows, turn on the ceiling fan, relax in the comfortable chairs and enjoy the breeze. When it gets too cool, close the windows and enjoy the same great view with some protection from the elements. 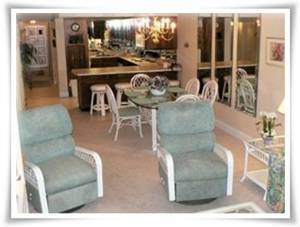 At night, turn on the ceiling fan lights, and enjoy conversation or games. There is a card table with 4 chairs available for use, and stored in the laundry room. Or, just rest and watch the moon over the shoreline, and the City lights. The laundry room has both a heavy duty washer and dryer, and plenty of space to hang wet towels and bathing suits. There is plenty of storage space for extra suitcases, etc. A porta playpen is available and stored here, as well as brooms, etc. 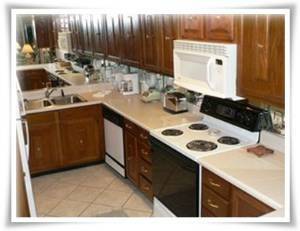 The large, fully equipped kitchen has everything you need to prepare breakfast, a snack, or full gourmet meals. There is a dishwasher, and ice maker in the refrigerator. There are full sets of dishes, glassware, and silverware, and lots of small appliances. The breakfast bar has 4 chairs for kids or the cocktail crowd. The dining room table seats 6-8 for a meal, games, or cards. But remember, you're on vacation! 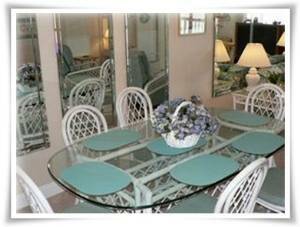 Regency Towers features just about everything you could want on vacation. 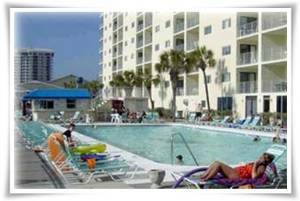 There are 3 pools right on the beach, including a kiddy pool and heated pool. Enjoy the sun in one of the plentiful lounge chairs. The Jacuzzi is inside right next to the pool deck. Hungry or thirsty? Stop by the poolside Snack bar. 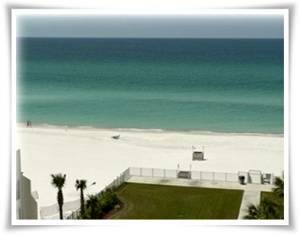 Beyond the pool decks is the wide beach with its famous sugary white sand and crystal clear Gulf of Mexico water. Beach chair service is available from the beach vendors. If you are the adventurous type, you can rent wave runners or go parasailing and soar over the Gulf. And there’s more. Regency Towers also has an Arcade game room, billiard room with 2 full-sized tables, and state-of-the-art fitness center with sauna and showers. Lighted tennis courts are right on the property. Regency Towers is gated with 24 hour security guards so that you have a safe vacation. Panama City Beach is undergoing an amazing transformation to an international family destination. While your favorites are still around, new restaurants, shops, and entertainment venues are opening every week. Pier Park is a brand new shopping and entertainment complex just a short ride away. Visit the Ripley's Believe It Or Not Museum and see the weird and unusual collection of exhibits. Jog to St. Andrews State Park for amazing seashells. Walk a few blocks on the sand to the world-famous Schooner’s for casual food, drinks, and dancing and volleyball. Charter a fishing boat from the marina, just a couple of miles away. And yes, there are still plenty of places to play mini golf and race go-karts! We use Premier Beach Properties for local 24/7 guest support to ensure that you have the best vacation possible. Enjoy your stay in our beach home! Off Street Parking: *Gated resort with 24/7 security. My family stayed in this condo last year and had a blast! The unit was VERY clean and VERY spacious! We had 8 people with plenty of room. The owners were awesome and worked with us 100%. We loved the fact that we could feel comfortable with the kids doing their own thing since the community is gated. The only negative was that the elevators broke down often. It wasn't a big deal most of the time because we just used the stairs. Overall, the best vacation yet! We would definately come back! Ask about SPECIALS, or to beat another rate! CLEANING FEES AND TAXES ARE INCLUDED! You must be 25 years old.